Diversity is directly linked to enterprise success. Research has clearly shown that groups with greater diversity out perform heterogeneous ones. As a champion of diversity, ITAC works with industry partners to spearhead initiatives that support “tech savvy and tech positive” learning and career choices for girls and women at strategic points within their development. The ICT sector has struggled to attract young women. Engineering and computer science have remained largely male fields of study at universities in Canada. Many young women in high school believe ICT companies would not be places at which they would want to work. The top 10 Canadian information and communications technology companies (ICT) have an average of 16.5 per cent female representation. The ICT sector has typically trailed behind other sectors, such as financial services, in terms of board gender diversity in Canada. There are few women board members to serve as role models. ICT companies tend to be smaller and newer entities, which presents particular challenges. Engage the ITAC Board of Directors and their organizations to actively assist in driving visible and meaningful action around workplace diversity. 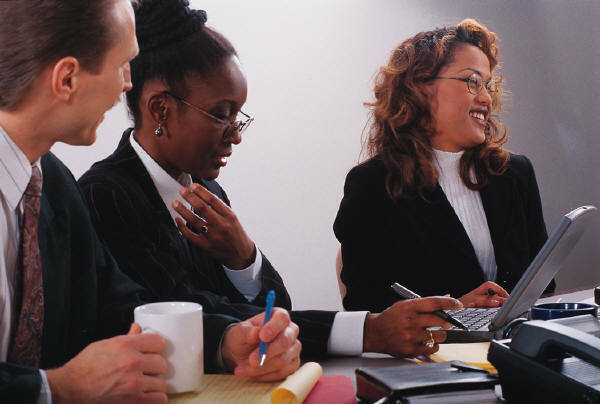 Support governmental and stakeholder which target workplace diversity as a priority. Leverage the strengths of ITAC Talent and associated stakeholders to ensure the best programs targeting young women receive the greatest support. The imbalance of women serving on Board’s of Director’s of Canada’s corporations continues to persist despite significant evidence that diverse boards are better boards, diverse boards deliver superior financial returns, and most of the country’s securities regulators have instituted “comply or explain” regulations to begin to redress this disparity. 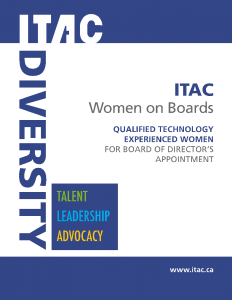 In 2013 ITAC’s Diversity Advisory Council commissioned a white paper titled ‘Gender Diversity of Boards of Directors of Canadian ICT Companies’, to understand the situation within the technology industry and to identify any obstacles to appointing women to boards. The author, Karen Wensley, discovered that only 16% of Canadian ICT boards had women directors and this low participation rate was due to qualified women not generally being part of their network, nor did they know where to reach out to find them. By 2015, women held less than 10% of ICT board positions, and 55% of publically traded Canadian ICT companies had no women at all. In order to facilitate ICT companies in addressing this imbalance, ITAC’s Women on Boards committee, led by Mary Whittle, has established a registry of technology experienced women who are qualified and interested in Board of Director’s appointment. Candidates were invited to participate in “Board Discovery Days” where thought-leaders and educators from Rotman/Institute of Corporate Directors and Degroote/Director’s College shared the qualifications, requirements and roles of Boards of Director’s in providing excellence in governance. Following these sessions interested women were invited to submit their resume to be included on the list. A registry of 33 women from the technology industry who are qualified and interested in serving on corporate boards has been created and will be updated on a periodic basis. This list is available to all ITAC members as well as organizations and government offices who play a role in redressing the gender imbalance in Canada’s boardrooms. Publicly support organizations promoting diversity options. Create a diversity registry of board-ready women. Showcase successful female business leaders and share their learnings, advice and guidance with our members. Work with educators and industry through ITAC Talent to promote tech savvy careers. As part of its efforts to boost female entrepreneurship, ITAC supports the initiatives of Girls Raising and international organization resource community created to assist ambitious female founders with starting, building, funding and growing their businesses. ITAC partners in Girls Raising events and committed to providing ongoing sponsorship. ITAC members interested in providing long-term support for joint Canadian efforts are being sought.